This is a eggshell porcelain tea cup with saucer, from the Qing Dynasty, Kangxi (1662-1720) period, ca 1680-1700. 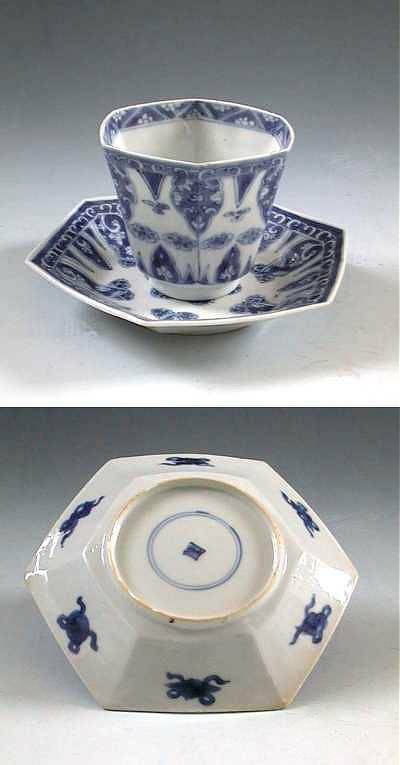 As could be expected of these early tea cups - when the saucer actually belongs to the cup - the saucer fits perfectly as a lid to the cup. This was because in the earliest days the tea was not made in tea pots but the tea leafs was put directly in the cup; hot water was poured over the leafs; and the tea was left to brew. While waiting for the tea you could admire the beautiful decoration on the saucer / lid. In this case a brocade pattern with flowers, probably copied from a silk design.